Oh Frankie, I just love this outfit, so comfortable yet still so chic. The floral motif kaftan is such a true beauty! Perfect for a summer day out at the vineyard. N, what a gorgeous caftan.. the print is just lovely. Here's to a great week! You definitely got me with this look! I adore your kaftan, it's really beautiful and I love how you added that hat to it! Stunning! The kaftan is stunning girl! that print is so lovely! i love all the colors involved! Sweet Mother of Abraham Lincoln! That top is to. DIE. for. I love it like a fat kid loves cake, and that ain't no joke. Not only caftan is fabulous but the whole look is amazing..
That's fabulous - what a perfect and chic summer look! Great top! Especially the differentiating designs. oh how awesome, a birthday at a winery! you must have looked so chic! Caftans are the perfect summer top. This outfit is amazing! Loving the shoes especially, and that top is insanely awesome. Lovely kaftan! The colors are amazing. And I love your shots in the mountains...so jealous of that backdrop! Amazing pics and you look so bohemian chic in your kaftan. Love the look- well styled. XO! Ohhh, I LOVE this top! What an amazing print! Great look and photos-love the shoes and bag...you look gorgeous! 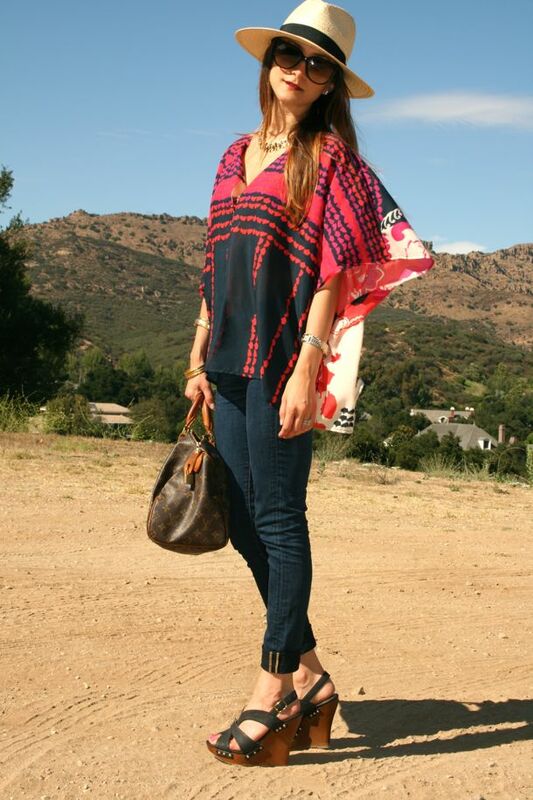 LOVE the caftan and the new wedges! Great summer outfit to celebrate a friends birthday. Great outfit! love your top and shoes especially! Awesome top! Looks so soft and flowy! STUNNING!!!!!!! !Seriously my fav look, chic and classic yet uber comfy! Me loves!!!! Completely agree - the perfect top for a winery. It looks lovely on you. Color + graphics + blousy = LOVE!! Gorgeous shape and swing Nic! Very Rachel Zoe meets MK all day! Head to toe hot...love this look! Loving the caftan! It looks great on you. I have been craving a new caftan as I look at all the great ones coming in for 2012! That print is beautiful! I have a couple Collective Concepts pieces that I just love! Those colors and print are to die for! Inspiring me to dig out one of my caftans. Hope you have fun at the winery. ADORE your caftan nicole you look STUNNING!!! Too cool for school babe! Your outfit, the winery, the sunshine...what a perfect Sunday! Love those shoes. They're fab. As is the top. i love this look... the blouse is just beyond and you look fantastic!!! def so cute on u - i think i might have to reproduce this outfit on me! That top is fantastic! Love how it has a different design on both sides. Absolutely love the Kaftan and beautiful colors:) You look great! Love the print of this Kaftan, perfect for this setting.